“Every time we can remedy a more difficult case, we find that an easy case remedies faster.” To the end of remedying all cases, L. Ron Hubbard had made a breakthrough embraced by a single powerful word—Beingness. What followed was brand‑new data from Mr. Hubbard on Beingness Processing, enabling a preclear to be or unbe anything. Here is the key to halt the downward spiral and move a being from Compulsive Beingness to Self‑determined Beingness—and straight on up to Knowingness. Of no less significance were the training breakthroughs, with students learning not only what to audit, but why, and an auditor training approach no ACC student could have expected. Rather than theory instruction, he relayed the data by processing the group. That meant 48 sessions on subjects including the Second Dynamic, imagination, changing ideas, exteriorization and ownership. And with a meter, the E‑AR‑400, to demonstrate the basal metabolism test, Mr. Hubbard explained the relation between thetan and body as regards metabolism, with students checking their metabolism on the E‑AR‑400 before group sessions. 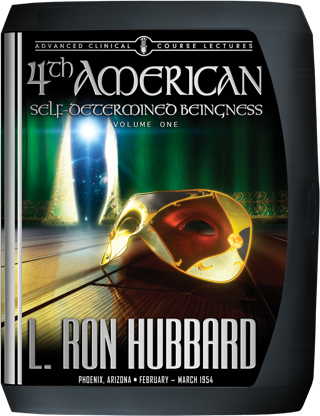 When the 4th American ACC concluded, some 30 auditors promptly went to work in the field, generating miracle after miracle success by applying these breakthroughs from L. Ron Hubbard. It was 15 February 1954 and L. Ron Hubbard was about to deliver an ACC like none other. So great was the advance of technology, so intense the excitement generated by the miracle results from graduates in the field, that applications for enrollment could hardly be met. The 3rd ACC had just completed and, with the Hubbard Association of Scientologists now established as a permanent base in Phoenix, Arizona, Mr. Hubbard scarcely paused before starting delivery of the 4th American Advanced Clinical Course three days later, at 616 North 3rd Street. With a planetary population numbering billions of preclears, his focus remained as before: to undercut the level of training to enable any auditor to handle any case, and to undercut auditing techniques so that even “impossible” cases could be cracked by any auditor. To just that end, Mr. Hubbard had already made another milestone breakthrough contained in a single powerful word which yet had vast ramifications—Beingness. What followed was brand-new data he discovered on how to remedy beingness in the preclear with Beingness Processing—processes to enable a preclear to be or unbe anything. Then again, of no less significance were the breakthroughs as regards training. For what L. Ron Hubbard sought to instill in the auditors attending the 4th ACC was far more than the ability to rotely execute a process (even when that rote execution did bring results). Crucial was the auditor’s understanding—that he knew not only what he was auditing, but why. As for how Mr. Hubbard would accomplish this, it was a training approach not one of those ACC students could have expected. Because rather than pure theory instruction, he instead processed the group in order to relay the data. That meant 48 sessions on subjects including the Second Dynamic, imagination, changing ideas, exteriorization and ownership. Hence, the students learned by receiving the processes and achieving their results, thereby gaining subjective reality that enabled them to use what they had learned to audit others. In fact, so important were these Group Processing sessions to future research, L. Ron Hubbard insisted on no unseen variables that could obscure an analysis of case results. Therefore, instead of the customary practice of twinning students who were in need of repair or simply desired more auditing, he even set up rooms with newly acquired tape players so the students could replay the recordings of Group Processing sessions and receive them again—straight from Mr. Hubbard. Then, after each series of group processes, he gave an overview of the theory that lay behind the auditing he had just given. Case in point: In his legendary lecture, “What Your Preclear Is Trying to Do,” he detailed the basic motivations of a thetan and how, by understanding them, an auditor remains in command of the session. Nor was that everything this ACC represented in terms of the application of technical advances. For in the very first lecture, Mr. Hubbard instructed those auditors in something that is today an integral part of standard auditing procedure—a basal metabolism test. He used a small meter, the E-AR-400, to demonstrate the test while explaining the relation between the thetan and his body as it affects metabolism—data so fundamental to every successful session that no auditor or pc can be without it. More to the point of this ACC, that E-AR-400 sat in a room for every student to check and/or handle their metabolism before group sessions. Aliveness—a man is as alive as he has hopes and dreams, and how to recover his ability to postulate the future. When the 4th ACC concluded on March 26, some 30 select auditors streamed back into the field and eagerly put to use the auditing skills they had acquired. The impact of L. Ron Hubbard’s breakthroughs reverberated throughout the Scientology world, generating miracle success after miracle success into his Phoenix headquarters even before the next ACC began three days later. While as if to put an exclamation point on the advances made, this ACC marked yet another milestone that truly stands as the most historic date in Scientology’s history: the 18th of February and the incorporation of the first Church of Scientology.